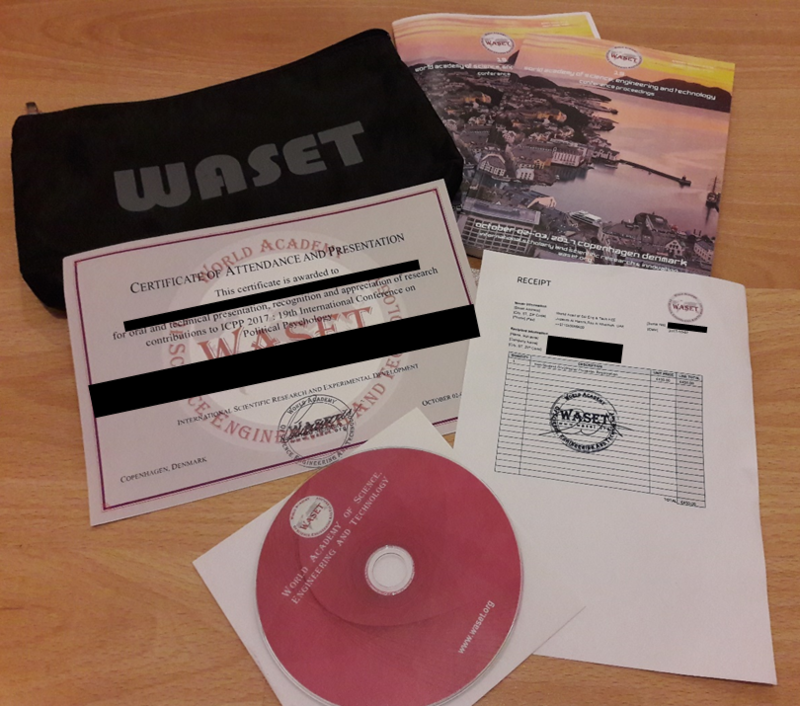 WASET Watch – "The World Academy of Science, Engineering and Technology or WASET is a predatory publisher"
"The World Academy of Science, Engineering and Technology or WASET is a predatory publisher"
WASET was one of the “conference” organizers examined as part of a project involving the collaboration of journalists and data scientists from 23 new outlets around the world. The project sought to examine 175,000 articles published by 5 of the world’s most prominent pseudo-scientific publishing platforms and conferences including WASET. These, so-called predatory publishers are set up to appear like legitimate scientific conferences and journals but whose sole purpose is to give studies an air of scientific credibility while generating a profit. Until recently, these publishers have remained relatively under the radar, with few outside of academia aware of their presence; but the highly profitable industry is growing significantly and with it, so are the implications. To the public, “fake science” can be indistinguishable from legitimate science. The findings from the investigation highlighted the prevalence of the pseudo-academic conferences, journals and publications and the damage they can and are doing to society. The blog post, ‘Defending Science‘, provides a summary of the talk. List our experience at a conferencean an event organized by WASET.org. Explain why such “conferences” exist and the history of this particular “conference”. Show that this organizer has planned 58,669 “conferences” across the 183 events they have scheduled for 2018. Illustrate how these events could have netted its organizers €3.8m in 2017. List the number of academic institutions (university and other) that we spotted, with .ac. *, .edu. * and .edu email domains linked to abstracts and papers on the WASET.org site. Worldwide, we spotted 1,017 academic institutions including Stanford, Yale, Notre Dame etc. In the UK, we spotted 119 including UCL, Sheffield, Leeds etc. Briefly discuss the impact of such organizations on science. Suggest (show with an example ) that they don’t peer review papers, using an example. For those interested, we documented our experiences with WASET in order to build a case to reclaim the “conference” fees from our credit card company. We also passed the same information to Action Fraud in the UK. WASET conferences events are at best highly dubious and at worst a form of fraud or scam. If you are expecting an acadamic conference (as their website eludes to), the following post provides information which you should consider and seriously evaluate before submitting research and/or attending. It also describes how we found out the hard way. In January 2017 we were reasonably far along with some research and wanted to present a summary / abstract at a suitable academic conference. This is a standard practice for authors seeking feedback from their peers in the same field. We identified and selected the International Conference on Political Psychology (ICPP) ran by the World Academy of Science, Engineering and Technology, or WASET. The conference event was held in Copenhagen on October 2nd and 3rd 2017. On the surface there were no obvious signs that this was a scam. The website and accompanying conference text were consistent with other, reputable conferences. As you can see in ‘Figure 1’ below, it is billed as (represented as) an academic confernce on political psychology. We submitted our abstract and were of course delighted when we were accepted. We later find out that the acceptance critieria is very low and that (almost?) anything which looks like an academic abstract or paper will get accepted. That said we had to wait a number of weeks before receiving the acceptance; an immediate response might have tipped us off. (Toward the end of this post we show how we submitted an obviously spoof/fake abstract which got accepted). With the benefit of hindsight, the only possible indications that anything may have been amiss prior to the conference were that the joining instructions were very sparse and the “conference” sessions were crammed in to three, one hour slots. Sparse joining instructions were something we’d experienced at other academic conferences and we put the short session lengths down to an administrative mistake. In our, albeit limited relatively experiences, administrative mistakes and typos aren’t unusual in academic conferences. At the conference event it quickly became apparent that all was not as it should be for a number of reasons. Firstly, barely 10 people attended. Having been to a few conferences, it’s not uncommon for authors to fail to attend, but such a small number of attendees is highly unusual. 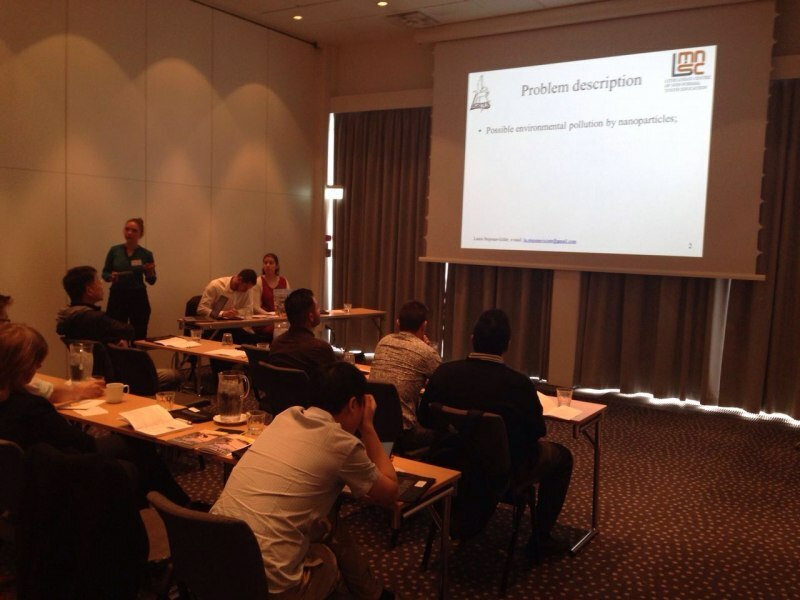 The picture below shows a WASET event in the same hotel (Park Inn, Copenhagen Airport), but on a different date. The room and layout look identical to the event held on the 2nd October 2017. The number of people you can see in the picture is consistent with our experiences at the event. i.e. Approximately 10 attendees. Secondly, the presentations covered wide range of topics from powering robots to planning urban landscapes; It was not an International Conference on Political Psychology as it was marketed to us. Each participant had signed up for one of the following conferences, although it was clear that not all participants made it to Copenhagen. Later in this post we’ll get to the part where WASET market hunderds of these “conferences” from a pool of 49,844 titles. All the “19th Int Conf.” on something. That such a wide range of “conferences” were brought together in one room, was not something that was made clear prior to the event. We were not alone in having failed to spot this as we’ve illustrated in this anonymised email conversation with a senior lecturer at a prestigious UK university. The Oxford dictionary defines a conference  as follows, although the definitions seems to suggest that a conference involves more than one person with a shared interest. I’m not sure what an event for one would be called, but “conference” doesn’t meet the Oxford Dictionary definition. Thirdly, if it’s not already bizarre enough to have speakers talk about such a diverse array of topics, the entire event was indeed crammed in to 2 hours on the first day and 1 hour on the second day. We didn’t attend the second day, not because we knew it was some form of scam, but because it was dreadful. We only joined the scam-dots a little later. In short, the service delivered was NOT as it was marketed and it was certainly NOT a conference on Political Psychology. It was and is, some form of scam, and not something we had any prior knowledge of. There are strong parallels to fake diploma scams and, for UK readers, the 2008 ‘Winter Wonderland‘ scam , which saw its owners convicted of misleading the public in relation to a Christmas market. “The New Forest attraction promised a “winter wonderland” of log cabins and a bustling Christmas market. At this point I’d simply put this down to being a terrible, terrible event where a significant number of authors had pulled out and sessions were consolidated rather than cancelling the event. We requested our money back and that they remove our paper, but were informed that this wouldn’t be possible as we had acknowledged that the conference was multidisciplinary. See the red ellipse in the image below, but also note that the entire context is still “International Conference on Political Psychology“. Taking the Oxford dictionary definition of multidisciplinary (see quote below), we assumed the topic/problem at hand would be political psychology. In terms of political psychology, you may wonder how it could ever me multidisciplinary as it already seems niche. Please take a look at the contents of the Oxford Handbook of Political Psychology to get an idea of the diverse themes within political psychology. Given that the context of the registration page remains as the “International Conference on Poltical Pyshcology”, we naturally (and reasonably) assumed the multiple disciplines would also be within that same context. Was it made clear that this was not the case? No. At this point we began looking (Googling) in to what exactly WASET is. Had we have been reimbursed, we may never have given it a second thought, other than it being a very poor experience. After the “conference”, and looking (Googling) more closely, it became clear that the WASET “conference” are well-known scams (or rackets?) in many academic circles , , , . It had simply not occurred to us that such scams/rackets existed. Everything seemed consistent with our experiences at reputable conferences such as those organized by IEEE. For example, the payment of registration fees was unsurprising as we’ve experienced that at reputable conferences. Additionally, the website ran over HTTPS, and credit card payment was via a reputable payment processor, again, entirely over HTTPS. Security wise, on the surface, the site seemed better than many legitimate conferences. Attract unsuspecting researchers like ourselves and attempt to fraudulently obtain intellectual property. In the U.K. this could be considered fraud by false representation . Attract presenters who know exactly what’s going on and are looking to have their research published anywhere. This can be considered equivalent to a fake university degree or diploma. The author’s C.V. (résumé ) looks padded and may result in a promotion, a practice which appears to be surprisingly common in some countries. A quick search of LinkedIn uncovers a large number of people who reference work published at a WASET conference event. Attract presenters who know exactly what’s going on and are looking to have their institution (University or otherwise) pay for a trip to a foreign city to attend a legitimate sounding conference. A combination of #2 and #3. It is conceivable that this scam works to serve other purposes, but arguably #2 and #3 (above) are the most plausible reasons that these conferences still exist. i.e. It’s a racket which allows researchers to pretend that they’ve had their work accepted and presented at an international conference; the same researchers (possibly) get a funded holiday to a new city and WASET make (a lot of) money. Everyone’s happy except the unsuspecting researchers who just happen to get caught in the net and whoever funds them. The unsuspecting researchers may well be in a minority and are not the droids WASET are really looking for. After emailing potential future victims from ac.uk and .edu institutions, a small number of people responded with thanks, checking with their institutions and withdrawing their abstracts…. FWIW, you will get a certificate, and here’s what it will look like. You may note that the certificate has the “conference” title, however, that’s the only thing which references the conference title. In the program and booklet, everything is grouped in some generic pot. And it’s not just individuals who cite their presentations at the WASET conferences, companies are at it too; either wittingly or unwittingly. Company researchers may be too embarrassed to flag that they fell victim to a scam and so their attendance at “The International Conference of ________” is proudly presented on a corporate news page (We contacted the companies we spotted, but heard very little back). It’s also possible that unscrupulous staff publish their work at predatory conferences in order to hit their annual research goals or help their company obtain business/research grants. Perhaps such practices are actively encouraged by heads of research? Who knows? Our hunch is that there are a lot of charlatans floating around. To get a sense of companies, universities publishing their attendance at a WASET event, try Googling -site:waset.org inurl:news waset.org. Once someone’s presented, surely they know the deal? Events like WASET attract submissions and attendees by copying (or slightly changing) the names of legitimate conferences and they appear high up on Google searches. To the unsuspecting academic, such conferences appear legitimate . To people in the know, it’s a short-cut to building up an impressive sounding “research portfolio”. As long as people (recruiters and other third parties) don’t look another level deeper, they get away with it. We have compiled a list of the 49,844 unique (there are many duplicates) “International Conferences” which WASET are advertising for 2018, many of which sound remarkably similar to other conferences. You can find these simply by browsing their website here. son bora ardil ( msc , computer eng , okan uni , istanbul – tr ; phd student , computer eng , okan uni , istanbul – tr ). According to the receipt we received for registering for the conference, WASET are registered in Jazeera Al Hamra, Ras Al Khaimah, United Arab Emirates (UAE). WASET are registered as ‘World Acad of Sci Eng & Tech FZE‘. WASET events are held in hotels and other venues around the world. Based on our own analysis from publicly available information, there are 183 WASET events scheduled in 2018, consisting of over 58,669 individual “conferences” (on average, ~320 unique conferences per event). Participants pay between €350 (listeners) and €450 (speakers) to attend. 49,844 conference titles, a number of which occur multiple times in a year. WASET appear to have 49,844 conference titles to chose from too. The difference between the 58,669 figure and the pool of 49,844 is because some “conferences” are held multiple times. For example, the ’20th International Conference on Automatic Control Systems Design’ (ICACSD) will be held in Amsterdam, Dubai, Instanbul, Venice and Zurich in 2018. But don’t confuse the ‘International Conference on Automatic Control Systems Design’ with the ’20th International Conference on Automatic Process Control Systems, Analysis and Design’ (ICAPCSAD), or a whole host of similarly sounding “conferences”. If this is not indicative of a scam or a fraud by misrepresentation, I don’t know what is. Fig 4. WASET conferences and locations, remainder of 2017 and 2018. WASET have events scheduled up December 30th, 2030 (and possibly beyond) with authors already scheduled to speak about their research. de Volkskrant’, a Dutch daily morning newspaper report that WASET began running such “conferences” in 2007 , but WASET wasn’t Cemal Ardil’s first conference venture . In fact, WASET is the result of a previous scam journal/confernce run by Ardil called ‘Enformatika’. Enformatika was closed down after İTÜ professor, Prof. Tayfun Akgül, who writes under the nickname “Conik Author: Piref H. Ökkeş” in Matematik Dünyası (Mathematical World Magazine), wrote an article in the magazine titled “I’ve sent a paper to bogus conference”. Enformatika was shut down after this and reemerged as WASET . Enformatika is still visible via the Internet Archive here. The similarities with the current WASET.org site are uncanny and the Internet Archive provide a way of seeing when Enformatika stopped and WASET started (See image below). In 2016, WASET took steps to prevent Turkish internet users accessing sites that were critical of it. SoL, a Turkish newspaper reported that on 14th March 2016, the lawyer Ceyhun Gökdoğan, acting on behalf of Cemal Ardil made a request to the Istanbul 10th Criminal Court of Peace to block access to a number of sites critical of WASET. SoL reported that this request was granted on 17th March 2016. .
A large number (at least 1,017) of universities and other academic institutions have material linked to them on the WASET website. Our analysis was limited to lead authors who submitted material for 2017, 2018 and/or 2019 and therefore the scale of involvement is likely to be far higher. This material is in the form of abstracts or short papers, where the person was identified as the presenter and has a .ac. * , *.edu. * or *.edu email address. This doesn’t include universities with domains like ucalgary.ca, uni-stuttgart.de etc (yes, both of them were in the list too). It should be noted that having material on the WASET website does not mean the presenter ultimately paid for or attended the “conference”, or even submitted it. Researchers may have spotted the scam and attempted to withdraw their submissions or had their email addresses used without their permission (although the site does ask for verification when you sign up). 119 UK universities are among those with abstracts and papers (using institution email addresses) available on the WASET website, dated between 2017-2019. University College London (UCL), Sheffield, Leeds and Cardiff top the list. UCL has 13 unique email addresses associated with lead authors, while Sheffield, Leeds and Cardiff have 12, 11 and 8 respectively. The numbers should be treated with caution, as after posting this write-up, a leading UK University contacted me suggesting that the numbers from my cursory analysis may be low and that they had identifed more unique email addresses associated with their university. Contacted and Warned : We have uploaded a full list of UK and non-UK academic institutions with material (on WASET.org) referencing their institution available here. We also sent email to all of the people we found on the WASET website with .ac.uk (113) and .edu (216) email addresses. For the .ac.uk addresses, 15 out of 113 people replied with some form of thanks. WASET are using university emails and abstracts without permission. e.g. Copying abstracts from other sources. Researchers are past or future victims of this scam. Researchers are in full knowledge of the nature of the conference. In which case, do these universities know that they have researchers attending scam conferences? Could this be the 85% portion in the pie chart above? Altogether, between 2017 and 2019, UK universities have at least 303 unique email addresses associated with lead authors on a WASET submission; 190 have email addresses associated with an event prior to Oct 16th with the remaining 113 potential future victims (unless they know the deal?). Assuming they all paid the €450 registration fee, that’s €136,350 spent on a scam. This does not include travel, accommodation, food etc. Furthermore, a Google search for “site:waset.org ” suggests that our numbers may be very conservative indeed. This is a problem for universities as it indicates one of the following possible outcomes. They support publication in predatory journals and conferences. Their students are hoodwinking them in order to make it look like they’re presenting work at a legitimate conference, while also having an all expenses paid trip to a nice location. They and their researchers are getting scammed, spending valuable funding on fake conferences. For the universities represented on the WASET site (in our list), it would be prudent for them to determine whether they paid to attend and present at a WASET event, and if they did, did they know about the nature of the event? Assuming they were informed that it’s a scam, have steps been taken to prevent researchers attending in future? Academic institutions do seem to be aware of this type of scam, with some issuing ‘Scam Alerts’ . Other initiatives, such as ‘Think. Check. Submit’  and AuthorAID  are also raising awareness of the issue. Judging by the number of universities with WASET submissions, the awareness campaign and fight against scam conferences is far from over. Worldwide, for 2017, we counted at 8,558 unique email addresses associated with lead authors on a WASET submission. That’s €3,851,100 in one year. It should be noted that it’s highly probable that only a subset (maybe 25%) of those people paid. Even so, it’s still likely to be a considerable sum of money for a three person, tax-free organization with few overheads. It would be possible to get a more accurate picture by looking at the group photos WASET publish on their website. For example, there are 17 people at this previous (prior to Oct 10th 2017) event. WASET could attempt to claim that their events are multidisciplinary “conferences” in the widest possible sense of the word. However, if that’s the case, why specifically advertise and market the conference as an “International Conference on XYZ” (Where XYZ is any of the 49,844 we found and listed here)? It would appear that the “International Conference on XYZ” is beneficial to unscrupulous researchers, while also attracting unsuspecting researchers like ourselves. Clearly there’s a benefit in the “International Conference” veneer. In terms of the legality we assert that WASET obtained our registration fees and intellectual property (via copyright transfer) through false representation. This was the advice provided by an intellectual property lawyer we spoke with. WASET is just one event organizer. Beall’s list , identified over 1,000 questionable journals and conferences. WASET appears to be an academic scam of sorts. The interesting questions is, why are they still getting away with it? Conferences and events without peer review stand to set science back considerably if the consumers of the research don’t understand the difference between a credible source and a poor source . While academics may spot (and skip) poor research, that doesn’t mean the media and other people will. Look no further than the problems caused by the Anti-Vaccination movement. It might be helpful if scholarly search engines such as Google Scholar removed or at least flagged work published in predatory and/or scam conferences. All of this said, if you’re looking for credible looking receipts and certificates to justify and pay for that trip to Bali, then WASET have you covered. The following is a picture of the stuff you get from WASET to help with your cover story. Fig 7. Proof that you attended. Helpful for your expenses. We submitted the abstract to the 18th International Conference on Cyber Warfare and Security Systems (ICCWSS 2018), Amsterdam, The Netherlands, (Jan 22-23, 2018). “Introducing a Polymorphic Machine Learning Defense for Cyber Attacks against Gibson Mainframe Computers by Dr. Dade Murphy and Dr. Kate Libby. The title alone should raise red flags to anyone in the Cyber Security industry. For everyone else the following should have been dead giveaways. Of course, WASET could have been playing along, but would a reputable conference do that? “The Gibson”, is a/the supercomputer belonging to the Ellingson Mineral Company. We used the Ellingson Mining Company. “writing past the end of protected” pays homage to a seminal security article “Smashing the Stack for Fun and Profit” by Aleph One. It’s consideres a seminal work in “bringing the method of stack-based buffer overflows to the masses”. Seven proxies is in reference to a rather well known meme. ZeroR classifiers are arguably one of the most basic machine learning classifers. They’re largely worthless in prediction tasks, although that doesn’t prevent their use going unchallenged in papers where they’re clearly unfit for purpose, including some reputable journals. As an example, if 1% of oranges are bad and you want a machine learning classifier to sort out good organes from bad oranges, the ZeroR classifier will predict that all oranges as good (the majority class). That translates to 99% accuracy, because 99 times out of 100, the classifer got it right. If, after reading this, you are still unsure whether WASET is a scam/predatory conference or not. Please contact the appropriate department in your institution/company and request that they investigate. The appropriate department may be Procurement, Security, H.R., Compliance or some other department. 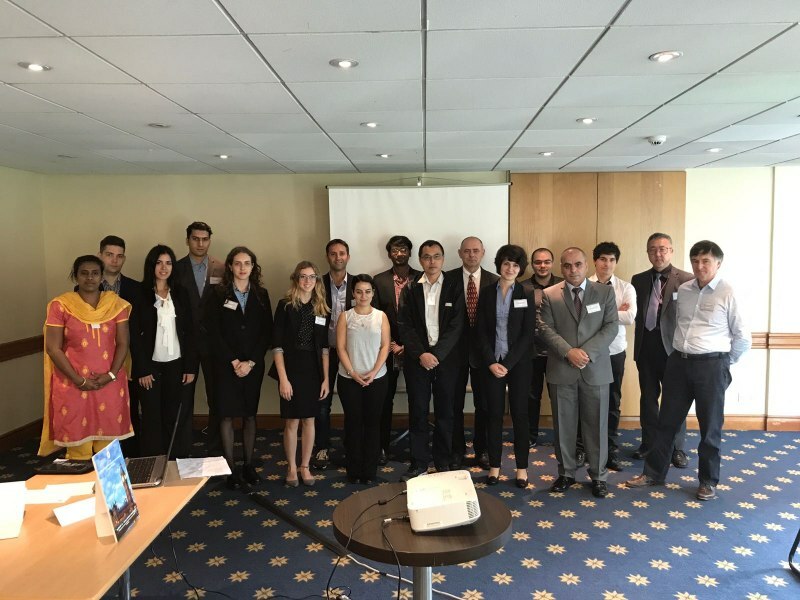 Minerals Engineering International – Are these WASET conferences just a scam? Wikipedia entry for Predatory Conferences. 5th Apr 2017 : Ottawa Citizen : Are universities complicit in predatory publishing? 10th Mar 2017 : Ottowa Citizen – When pigs fly: Fake science conferences abound for fraud and profit. DO NOT attend the conference (even if you’ve already paid). DO NOT sign any forms (not that this will help retrieve your intellectual property). REMOVE your registration details and change your passwords. If you are the victim of a WASET fraud, raise this with your local/national police force and immigration/border agents. In the USA. FBI Tips and Homeland Security. If you are the victim of a WASET fraud you may be able to contact your bank to reclaim the conference fees. WASET Watch Create a free website or blog at WordPress.com.